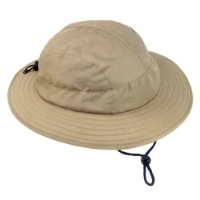 This is a new microfiber safari hat with a 2 ½” brim. It has a mesh lined crown with an elastic drawstring adjuster around the crown to fit just right. It has a moisture wicking sweatband and chin strap. Available stock in Khaki only - other colors available on a custom basis.